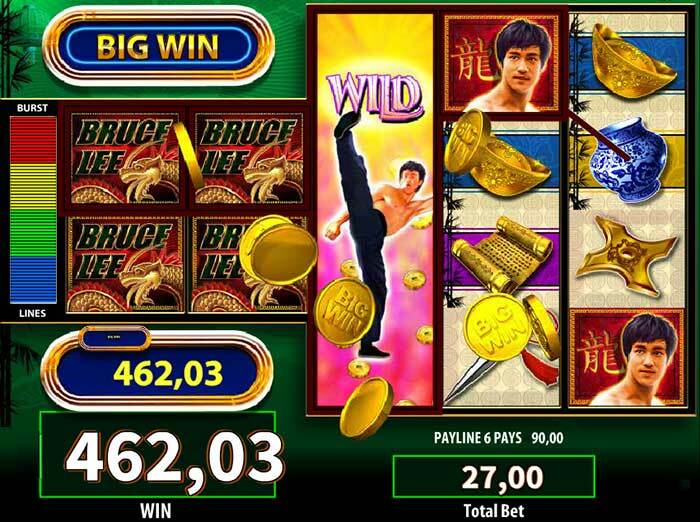 Bruce Lee is a slot from Williams Interactive (WMS) which has been online for a few years now and is definitely a classic high variance slot you should seek out to play, so good that it was a tough decision to not add the game to our Top 10 high variance slot guide. There are 3 different ways to trigger the bonus feature whilst playing in the base game, the first will be triggered by landing 4 matching symbols in the first 2×2 section of this slot, which can be made up of Wild Symbol substitutions also, the second way is a more regular style 3 scatter trigger (Gold Chests) on what are effectively called reels 5,6 and 7. And the final most interesting and hard to obtain and rewarding free spins trigger is to combine both of the methods mentioned above by landing 4 matching symbols on the front reels and 3 scatter chest symbols in 1 spin. 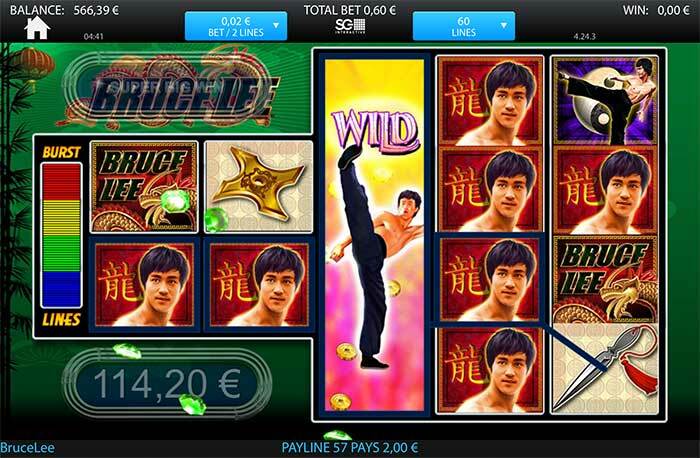 Bruce Lee is part of the WMS range that is called Money Burst, many of their other titles are divided into these various sub-categories such as G+ Deluxe, which help players identify just what kind of slot they are going to be playing, so if you find a slot from their range you like, you can then easily locate others. More recently WMS have also created a mobile friendly version of the slot, which features a slight graphical overhaul but looks and plays just like the desktop version with a few minor cosmetic updates and reel spin animations. The good new for players is that both the base game and the bonus rounds are both capable of producing big wins, the highest paying symbols pay quite highly, and given that you are getting 60 paylines for 0.30 credits even more so. The base game features stacked wilds on the main 3 reels and single wilds also on the front 2×2 reels. The most regular free spins triggers is gained by landing 3 scatters on the reels, this will then grants 5 free spins, with an added wild reel on the main reels every spin. If you manage to land 4 identical symbols (including wild substitutions) on the front 2×2 reel section, this will also grant 5 free spins, but instead will hold the symbols at the front of the slot with the 3 main reels spinning as normal (no added wild reels). Trigger 3 – The Dream! The dream bonus trigger is very rare, but is achieved by landing both of the methods mentioned above at the same, this will then grant 20 free spins as well as holding all the symbols on the front 2×2 reel, and adding a wild reel on every single spin too. If you manage to land either a high paying symbol or a combination that has wilds contained in the 2×2 section, then you can look forward to some huge payouts. It would not be uncommon to achieve wins well over 1000x stake during this round with a good combination, remember though this is an incredibly difficult way to trigger the bonus round so enjoy it if you manage to get one! Play at sensible bet sizes, this is a high variance monster slot, and can be very unforgiving if you don’t bet accordingly. Don’t chase the Dream Bonus Round, play the slot for fun and enjoy the big wins in regular mode! If you enjoy the Money Burst Style of slot then also look out for Fire Queen and Elvis both from WMS too. If you are looking for some other great online slots to test out be sure to read through our Top 10 High variance Slot Guide too. Where to play the Bruce Lee Slot? 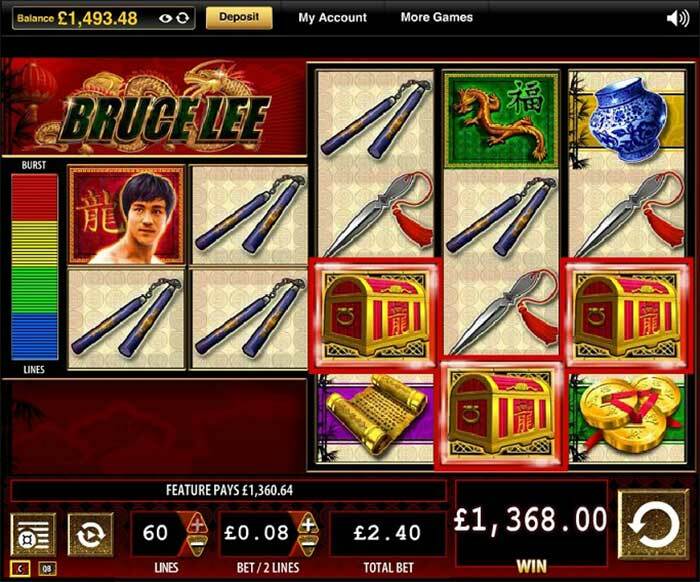 Thankfully Bruce Lee is very easy to find, and given it can be played on both mobile and desktop there are a wealth of great casinos in our recommend online casinos that run this slot, places such as Casumo, Videoslots, Redbet, Starspins and Slotsmagic are just a few casinos which stock a huge range of WMS slots including Bruce Lee.